On January 31st, Green Grid Radio shifts back to focusing on renewable energy and, specifically solar photovoltaics in Northern California. The upcoming episode is titled, “Commercial Solar: Communicating Long-Term Benefits in an Immediate World.” Our guest on the program is Vishvesh Jhaveri, Business Development Associate at local solar company, Silray Inc. We’ll discuss some upcoming Silray PV projects and even how solar policy incentives have made a lot of their work possible. Silray project for US Coast Guard in Petaluma, CA. So tune in from 6-7 PM (PST) at 90.1FM on the dial, or at kzsulive.stanford.edu on the tubes for another dense, thought-provoking addition to our catalog. Thanks for listening! Dr. Jim Salinger, New Zealand climate scientist, IPCC author, and recent visiting professor at Stanford talks about how a changing climate contributes to both increased severity and frequency of extreme weather events such as Superstorm Sandy. Matt Chalmers, a JD student at UC Davis joins us live over the phone to discuss how the inertia of U.S. government effectively hinders the timely development of policies for climate change mitigation, and whether technological progress and economic growth can solve the problem they took part in creating. As always, we also highlight the latest energy related news and present insightful comments and questions from our team members here at Green Grid Radio. Hosted by Sophia Vo, Adam Pearson, Erik Olesund, Kara Fong, Darren Handoko and Mallory Smith. Categories: Podcasts | Tags: climate change, economic growth, jim salinger, matt chalmers, sandy, technology | Permalink. This Thursday, the second season of Green Grid Radio continues with another perspective on climate change in the United States following Superstorm Sandy. 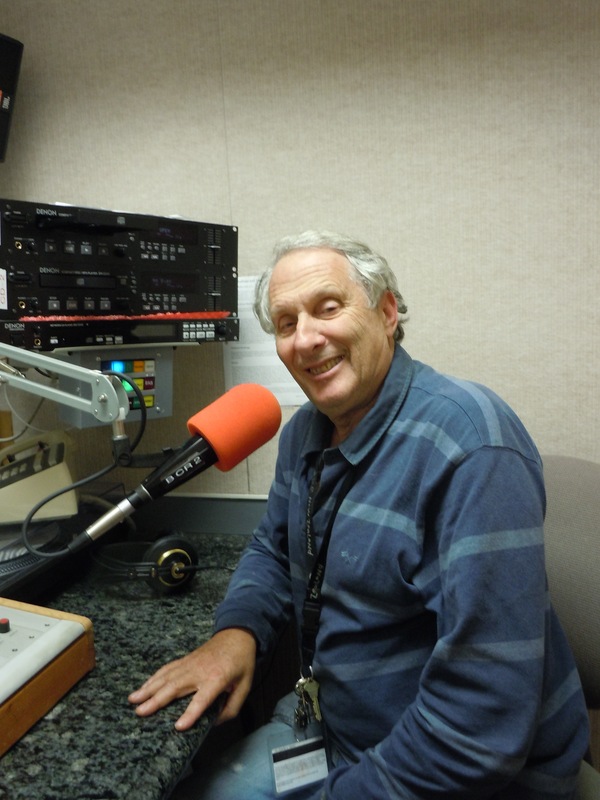 Dr. Jim Salinger, a New Zealand climate scientist and IPCC author is our guest on the program. Salinger will weigh in on the perception of climate change in the United States and the world at large, following the tremendously costly November storm, Sandy. Many topics about climate change will be discussed– such as ways climate change will impact food accessibility in developing countries, to how recent extreme weather events may spur new climate policies. Also returning as a panelist, UC Davis law student Matt Chalmers. Make sure that Green Grid Radio is a part of your Thursday routine! The show airs 6-7 PM (PST) at 90.1FM (in the Bay Area) or at kzsulive.stanford.edu on the internet. Student guests Sara Orton, Alan Propp, and Sophie Harrison visit our studio to talk about grassroots and bottom-up strategies to spur behavioral change and further education on climate change. Orton and Propp describe how they have worked on developing a climate change education curriculum in local high schools. 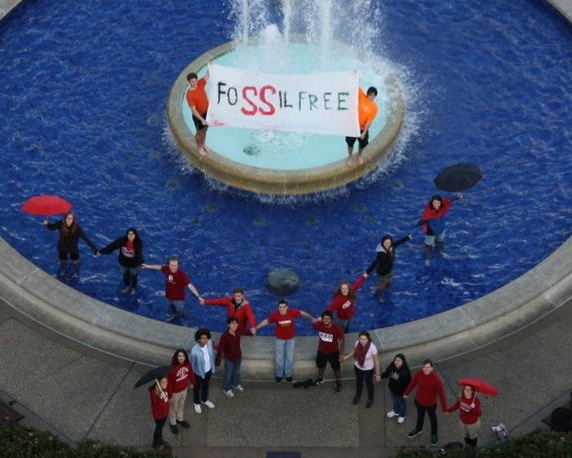 Harrison, who leads the Fossil Free Stanford movement, talks about the campaign to encourage the Board of Trustees to divest from fossil fuel investments. Our discussion also touches upon how climate change needs to be communicated in a less “doomsday”-like context, and instead framed in a way that highlights the positive results of a sustainable lifestyle (rather than a life of deprivation). As always the episode features the most recent news on energy and environmental issues. This first episode of season two of Green Grid Radio was hosted by Adam Pearson, Sophia Vo, Kara Fong and Erik Olesund. Categories: Podcasts | Tags: climate change, education, fossil free stanford, Stanford | Permalink. 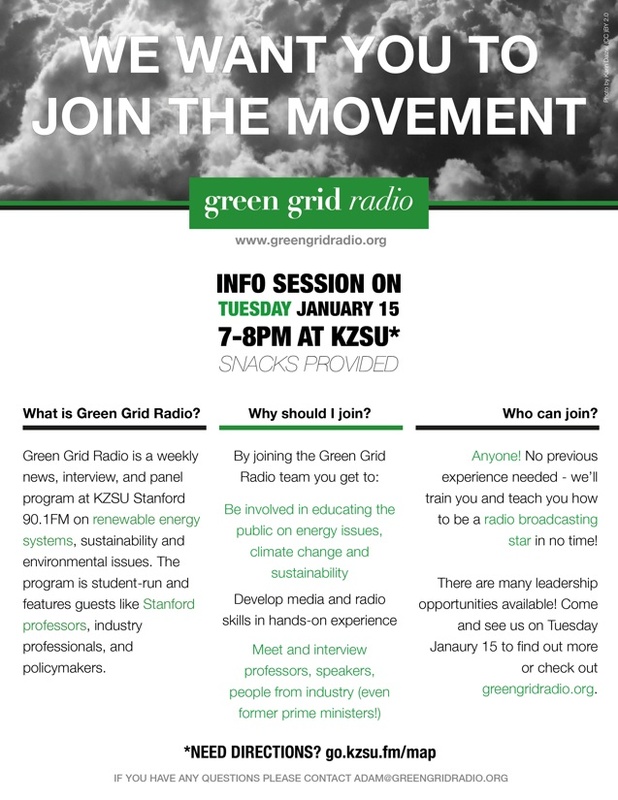 On Thursday January 16th, we’re opening up the second season of Green Grid Radio with another spotlight on Stanford! The show will feature student guests Sara Orton, Alan Propp, and Sophie Harrison. Orton and Propp have worked on developing a climate change education curriculum in local high schools. Harrison currently leads the Fossil Free Stanford movement to encourage the Board of Trustees to divest from fossil fuel investments. The panelists are tied together by goals of behavioral change, using bottom-up and grassroots strategies to achieve these ends. So tune in on Thursday from 6-7 PM (PST) at 90.1FM or kzsulive.stanford.edu for our exciting season 2 premier!